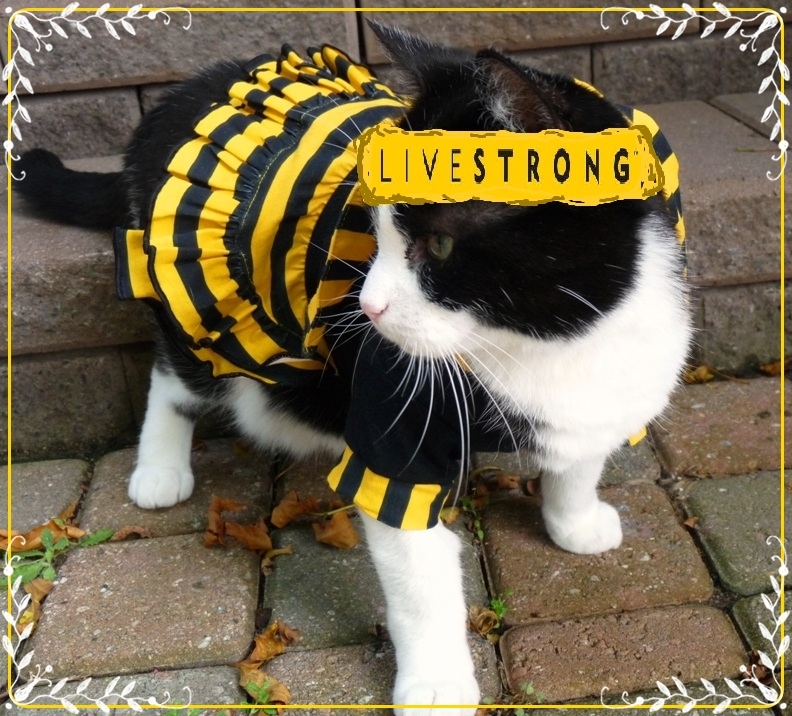 Wendy's 3-D Cats: 3-Ds CHEER FOR LIVESTRONG! Today is the day we support the fight against cancer, here and around the world. This post is for all of those who have, or are currently, battling this disease. However, cancer has touched someone very dear to me just recently, and she can use all of your purrs and pawsitives to support her in this fight. It is someone many of you may know and love, as well. Our own Crazy Cat Lady Carm has multiple myeloma and is currently undergoing chemotherapy at Roswell Park Cancer Institute in Buffalo, NY. Apparently, her spirits are high and she's up for the fight. Her case is highly treatable, and the fact that she is still relatively young and in good physical shape otherwise, is all in her favour. Still, it is a devastating diagnosis and an uphill battle, as it is with all cancer patients. Please join me in sending our love and well wishes to Carm. Dante, Dylan and Domino are leading us in cheers for her recovery. What do you got? LIVESTRONG, LIVESTRONG ... RAH, RAH, RAH!!! Live Strong and Live Long, Carm! Oh, noes, we didn't realize Carm had cancer and are sending her our loudest purrs. We're glad that her case is "highly treatable" and purray she will be cancer-free. We join you in purring for Carm and we believe our purrs will be answered. I am purring lots for Carm too! We are sending our purrs to Carm and purray her treatment is successful. My sisters and I send our very best purrs to Carm. 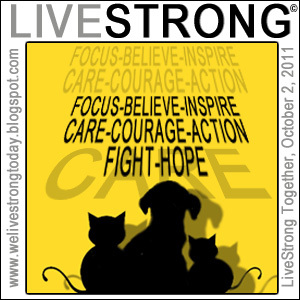 I really believe we can whip the evil C if we will LiveStrong together! Purring for Cam and that we live in a world that is cancer free someday soon! We purr and pray for a cure to this terrible disease. We didn't know about Carm either, but we'll send extra purrs and prayers her way. We are purring very hard for Carm and hope she beats this evil disease!! We are purring and praying for Carm! We also purr for a world without it cancer. What a wonderful world that will be. We join you in sending hope and strength to Carm! We wish for a world where no animal or human is effected by this horrible disease!!! We are purring for Carm. WE knew we had not seen a post lately and wondered what was wrong! We will have Carm in our thoughts and prayers. 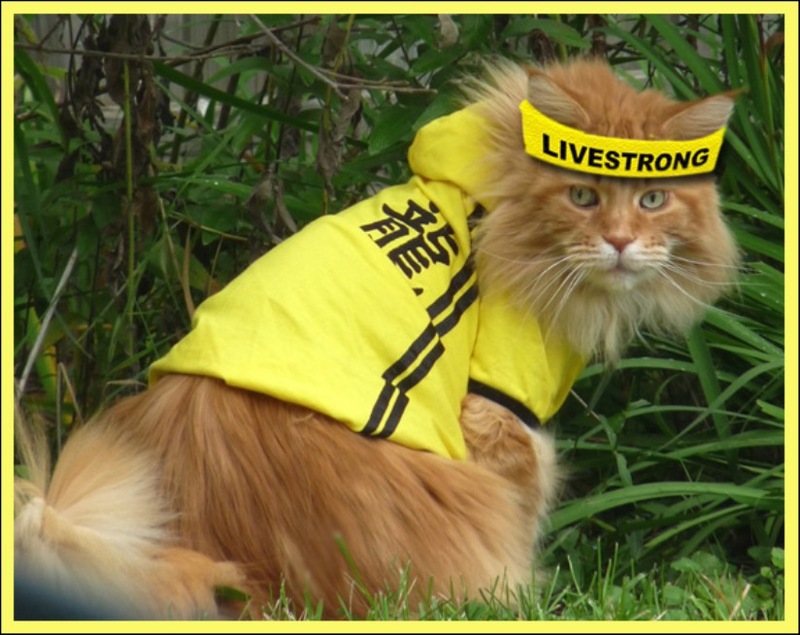 Great LiveStrong post and wonderful pictures. LiveStrong 3-D's.